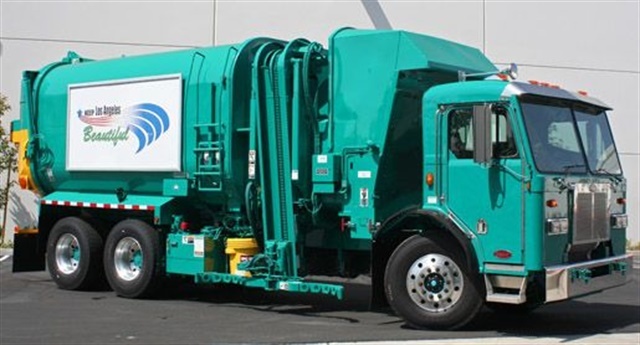 The electric refuse trucks are a continuation of a demonstration project funded by the California Energy Commission. The Class 8 electric refuse vehicles will use the Motiv All-Electric Powertrain to drive a Crane Carrier chassis, with an automated side-loader body built by Amrep. The trucks will bring the total of Motiv’s electric refuse trucks operating in North America to four, three of which are in California. "Fossil-fueled garbage trucks emit about 20 times the carbon of the average U.S. home. They achieve just two to three miles per gallon, and stick to standard routes, making them ideal electrification targets for LA's sustainability program," said Jim Castelaz, Motiv CEO. "We're proud that our all-electric refuse trucks will help the city achieve its cleaner air goals, as well as save on operational and maintenance costs." Similar to Motiv powered electric refuse trucks on the road in Sacramento, the Los Angeles trucks will have a payload capacity of nine tons and 1,000 pounds per cubic yard of compaction. All Motiv ERVs are equipped with 10 battery packs, expandable to 12 packs if needed for future route expansion. With up to 212 kWh of power, Motiv’s electric powertrain supplies enough electricity to efficiently move the truck and power the electric hydraulics throughout the day, according to the company. Using the Motiv universal high power charger, the ERV batteries reach a full charge overnight. Motiv’s electric powertrain is scalable for different applications from Class 4 through Class 8. Motiv says that it is suited for public works and city service vehicles and will contribute to the City of Los Angeles’s goal of reducing greenhouse gas emissions by 2050. The use of a single electric powertrain system for all the city's electric work trucks can simplify the maintenance and operation of a growing municipal electric vehicle fleet, reducing the cost of spare parts and training. This could enable cities like Los Angeles to expand their carbon reduction efforts through electrification of work trucks, transit buses and other diesel vehicles without placing a heavy maintenance burden on their public works departments. Related: Electric Trucks - Zap in the Pan?